My first night in town .. it turned out she'd cleared her schedule and so we celebrated .. just the two of us at a family-run cafe of sorts. The kind where meals are abundant .. and the food is spectacularly good. It wasn't long before he came bearing a cup of beef stew. She was so quiet and careful .. deftly angling her spoon to slice the raft of potatoes and carrots that had floated to the top. Watching her .. we decided to order two cups of the same. I was introduced to Ina Garten's beef stew by a co-worker .. way back when I still worked in an office. She had four boys at home and during the colder months .. made big pots of it on the weekends. Place the beef in a bowl with red wine, garlic, and bay leaves. In batches, dredge the cubes of beef in the flour mix before shaking off the excess. Place all the vegetables into the Dutch oven over the beef. to a simmer over medium heat on top of the stove. This stew is on my weekend list and I’m really excited. Thought I’d add my two cents regarding the stock. I’m lazy and almost always use soybean miso instead of stock. For everything! Oh that was truly unforgettable recipe, specially if being taught personally by someone who did it best. Being serve on memorable events and enjoyed with friends. By the way Beef Stew is one of my mother’s specialty too. Maybe quite difference version here in our country, but I’m gonna try the version of your recipe. Thanks! That looks so good! Beef stew is one of my favorite dishes to make in the fall and winter. It’s so hearty and warm. I can’t wait to try this. This looks so very yummy. I may need to try it tomorrow night as the weather here is so cold, damp and blustery right now. Trying out the local cafe is always a favorite thing to do, usually have such great down-home cooking. I would love to have watch that couple. The meal looks delicious. Yumm! This looks delicious. It isn’t the typical kind of stew I make, but I must make this one soon. Ali, this looks wonderful. I just made a beef stew with a similar technique taken from one of the Frugal Gourmet’s cookbooks. However, I love to add bacon bits and always leave out any additional salt. Next, I’ll throw the whole thing into the slow cooker on high for about five hours, adding sauteed onions and mushrooms in for about the last hour. One of my husband’s favorite meals of all-time. This is such a timely autumn/winter recipe. There is nothing like have a recipe from the creator in her own words. She may be gone, but her memory will live on every time someone makes her hearty stew on a cold winter day. I love Airbnb – I always have such unique experiences. It’s nice that you and your daughter share so many memories together, too. I love your food photography. I also love the savory flavors of red wine and Worcestershire sauce. For another month, we are living in the “real” whoville, that is to say Pacific Beach California. Mount Crumpit, where the Grinch lives, is Mount Soledad up the road from us in La Jolla. Suess wrote the book while living in San Diego after all. This reminds me of something similar I made this past weekend for our supper club, using more wine (of course). The recipe was from America’s Test Kitchen and a riff on Julia Child’s Boeuf Bourguignon. Their process is a bit more streamlined because of all the browning, as well as baking, happens in the oven. Much easier and far less messy. They had some great tricks for getting that great depth of flavor and everyone loved it! If you have time, you’ll have to watch the video on their website. My husband and I grew up with crockpot roasts, and remember how tough and boring the meat, potatoes, and carrots could be. Luckily, we’re able to do a little better now. Looking forward to giving “pot roast” another chance. Love your recipes! This looks wonderful! I love a good hearty stew on a chilly day! Definitely going to bookmark this one! There really isn’t anything that makes you feel warm and cozy like a good stew! This recipe sounds amazing! I wish I could spend some quality time with my mom like you do with your daughter. Between looking after my kid when I work and looking after herself and my dad there seems to be no time for going out just the two of us. The stew is mouthwatering but my stomach can’t hold anything that has been browned. I make it in the slow cooker instead. Ahh I love that your daughter has such lovely memories of the tasty dishes you used to make, this looks amazing!! I often remind my Mum of things she used to cook for us and the birthday cakes she used to make! I made it and the red wine was a bit sour. What wine did you use? Oh my goodness I loved reading this. I think that the .. Worcestershire, red wine and fresh spices really make this recipe a “MUST TRY”. It really looks and sounds incredible. Ok so I’m reading this after eating a small breakfast… Now I want to eat this like now… It sounds and looks delicious! I may just have to go buy ingredients to make some for dinner. Thanks! I really love the colours and vibrancy of this beef stew as mine and more darker with the gravy and potato! This would be so welcoming in our house particularly with the addition of spice. 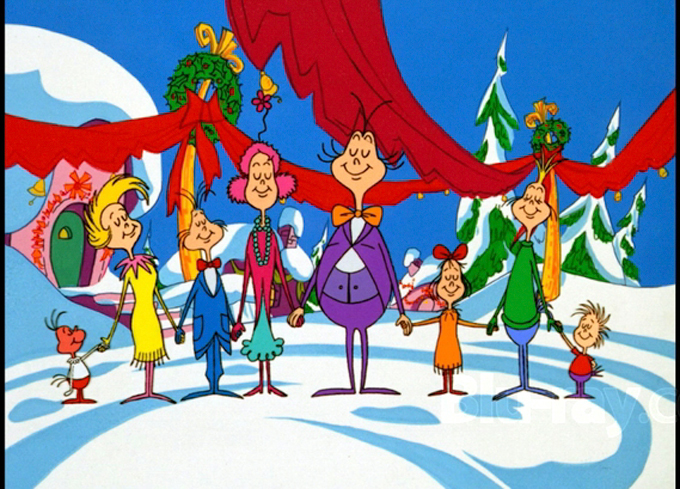 I want to visit Whoville!!! That stew looks so yummy and a great fall/winter meal for a cold day. lol I love that quote in the beginning about teenagers and needing a dog! That is so funny. I might need to steal it for one of my quotes. I love beef stew. It’s such a yummy dish. 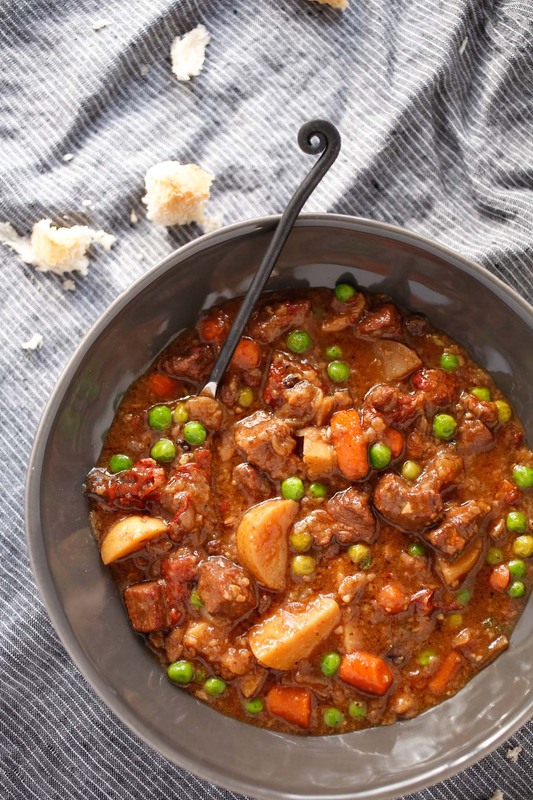 That stew looks amazing, and this looks like the perfect beef stew to have in hand for those winter nights. There is nothing better than sharing a meal with loved ones, it’s amazing how food brings back memories and is such an important part of family history. Oh my goodness, that stew even looks unbelievable. I’m trying to build up my list of great Paleo recipes…I have a feeling this one will be making that list. Plus with the colder Fall weather hitting, this makes a perfect meal. Okay girl you got my today’s dinner down- I am going to get my grocery list and try this tonight! Sometimes, the planets are aligned in your favor, and good things happen. I have been searching for a beef stew recipe forever. Most have been bland, with tough meat, rubbery and overcooked veggies. This one though! I adore Ina Garten and am so excited to make her version. What a lovely recipe. It looks so simple to make. I love the big chunks of vegetables. 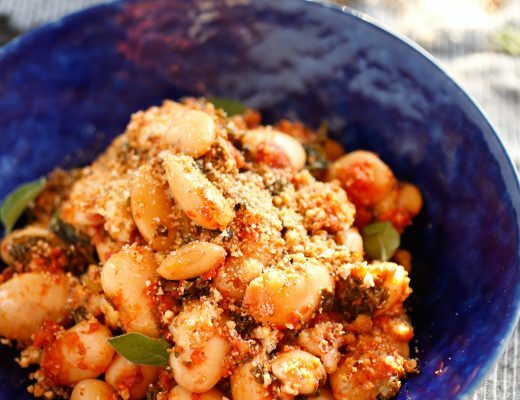 A perfect warming dish for this cooler weather. I wish you lived closer. That’s exactly what I’m saying to the stew! What a lovely story. When I read your post you made me miss my mothers Cabbage Rolls. She has passed now, but was a fabulous cook and made the best Cabbage Rolls. I have yet to find a beef stew recipe that’s a keep, so I can’t wait to try this recipe. I agree searing the meat is a must. It really add’s such a great flavor to dishes. This looks and sounds just incredible. I haven’t had a good stew in a long time, I am going to make this during the week this week. My family will love it! Made this over the weekend and it was amazing! I too have been frustrated with mediocre beef stews over the years; this will be my go-to beef stew now! Hubby said it was his favorite stew ever. I’m due in 6 weeks so mom and I have been making a bunch of meals for the freezer as well as for 2 sets of friends with newborns. This is in the last simmer and ohemgee — wow. Divine — so good. Thanks for this Ali, lots of new parents and one pregnant lady are very, very happy! 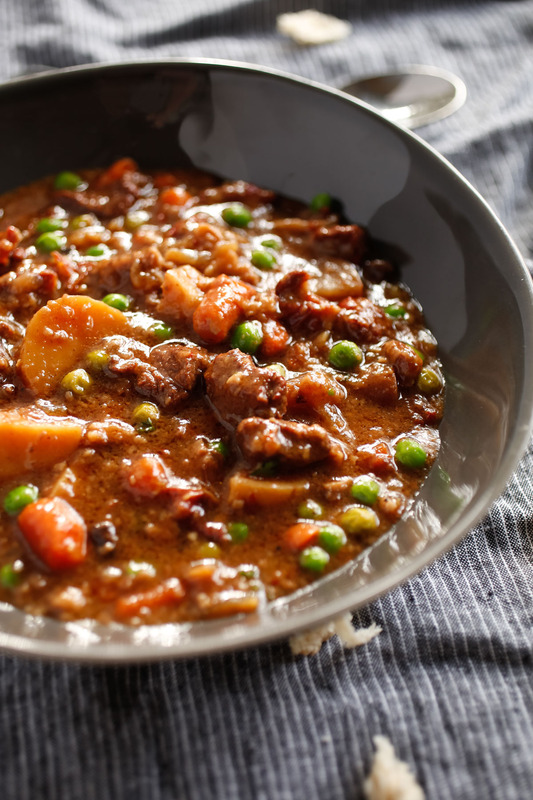 I love a great beef stew on a cooler or cold day! We are still in the 70’s and 80’s here but it wont be long before the weather is cooler. I am bookmarking this recipe!! That is such a wonderful story. Not only does the story warm the heart, but this dish seemingly does so too. 😀 It looks simple to make but I can imagine how delicious it will taste. Thank you for sharing this with us. It’s a great comfort food, for sure! Wondering if this could be made the day before a dinner party—would it make sense to complete the recipe through cooking the meat until tender, then finish the day of the party? Or would you just make it straight through and reheat the next day? I’m at work eating my leftovers after making this stew last night – yum! My husband and 2 kids (10 and 7) loved it as well. My daughter was wondering if it could be a little thinner. What do you think? Add more wine? more broth? Thank you so much for this recipe. 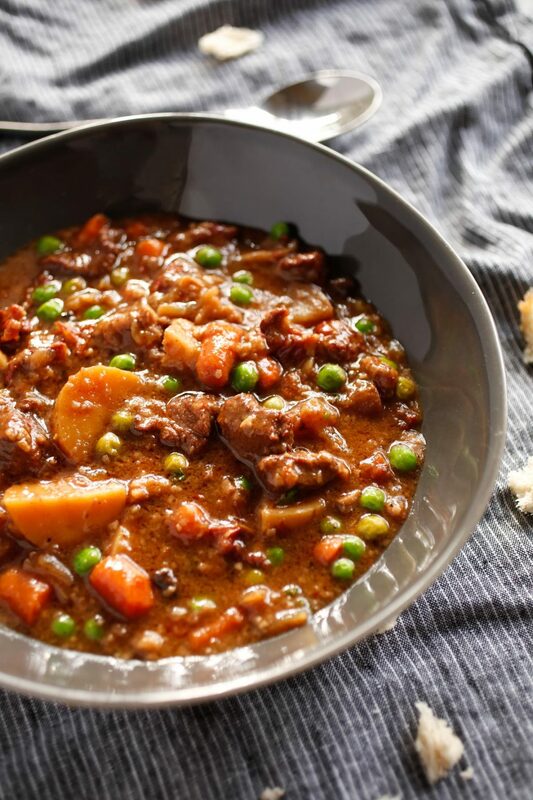 My husband loves beef stew and to date, I mostly found them to be boring – not anymore! What a beautiful evening that you had, I am so happy that you were able to order bowls of stew that reminded you of food from your past. It is great that you and your companions were able to feel content with your meal and ending up dreaming of pink unicorns. That sounds like a blissful evening and it is great that you were able to see your family as well. We all need some family time to recuperate! WOW! This looks absolutely delicious. I loved the story of having dinner with your daughter. Also, that you’re now sharing a beef stew from a friend who has passed away…such sweet memories. I will have to try this out! I must try this! Two questions: Would this be good with homemade dumplings, and if one wanted to add potatoes, at which point would you recommend doing so? Thank you! This looks so amazing! Gives me flashbacks to my Great Grandmother’s stew she would make us when I was little. I am saving this one. The love of Christmas in me wants to visit this place that you stayed at! This beef stew looks simply amazing. Perfect for the upcoming cool/cold weather. – What can I use instead of red wine? – I can’t find Worcestershire sauce anywhere near me, can I use something else? or maybe do you have a homemade recipe of this sauce? Thank you, and great recipe like always. Oh my gosh Ali, this looks so hearty and comforting. I almost wish it wasn’t 80 degrees here in Austin. I’m always up for an excuse to open up a bottle of wine!! First off, it is definitely a comfort food. But the hear about the remembering of times past was like I was there. Well written and such a good reminder to start traditions that will be something one day! XO. Stew is something that I would love to make cold winter dinner meal! This recipe is must try! On my next grocery trip I need to make sure I get all the ingredients! Goodness all these winter stews and soups look so good. I wish I had a few more options as a soup/stew loving vegetation. I’ll pass it along to my meat-eating friends. I could “smell” the yummy. Ohhh my goshhh….this looks amazing!! It’s seriously making me really hungry right now. I’m pinning this recipe and you can bet I’ll be making it this week! Thanks, Ali, love your site. Wow, what a great time you mom daughter must have had, I remembered the same of last week, when I drove to my native place and me and mom went off to have a dinner just for ourselves. I’m sure Ina’s recipe rocked then and is still rocking ! Sounds like it was such a beautiful moment with your daughter. I definitely hope to have moments like that when she gets older. It is a beautiful moment of shared memories. That’s so awesome. And the beef stew by Ina Garten is good. Every one of her recipes looks delicious. I will have to try it this “winter” when it cools off. Although winter in Southern California feels like a bit of an Oxymoron. I don’t eat meat much anymore, but when I was younger I remember my mom making a number of amazing stews from the book Staff Meals from Chanterelle. Truth? Those stews were my primary hesitation in becoming a vegetarian and now they are the only meals that still tempt me. I specifically remember the Lamb Tagine and Tripe Stew as favorites. This is such a beautiful story! 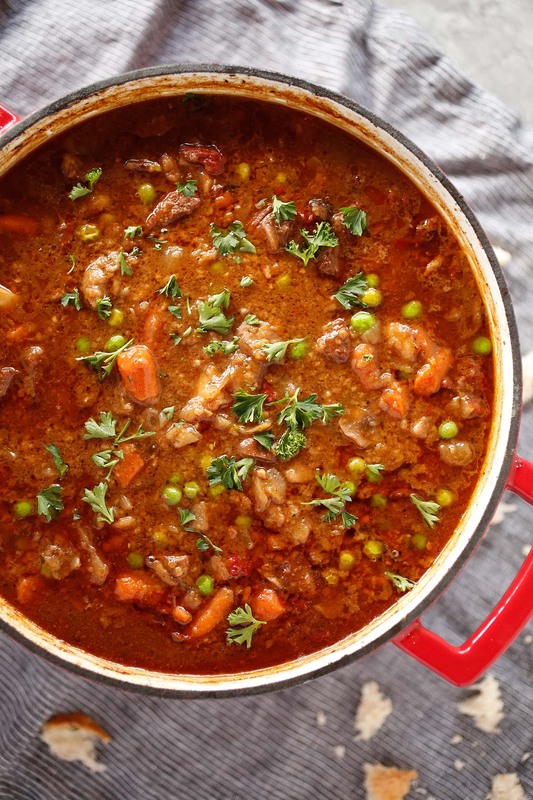 This looks dee-licious and it reminds me of my Grandmother’s chicken stew (We don’t eat beef)…I am going to share this recipe with her as she loves cooking. Mmm I love a good stew! I’m definitely going to have to make this for my boyfriend. But it was 90 degrees today, so it might have to wait a little bit until it cools down. The smell was heavenly and I thoroughly enjoyed it. My 9-year old let it cool and then separated the components but seemed to enjoy it all none-the-less. I felt like I’d done something a little gourmet but still completely soul comforting. Wanna hear a French butcher’s secret? Instead of using beef chuck, try making the stew with a lesser known cut, the rump tail (French: aiguillette de rumsteak). You won’t find this at the grocery, but any good butcher should be able to prepare that for you. Rump tail cubes will keep their shape when braised AND will become extremely tender. I highly recommend it! 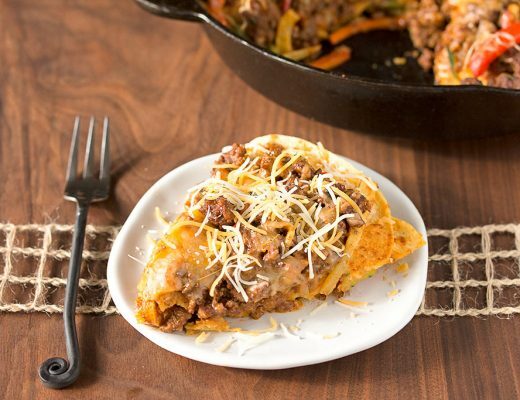 Been raining here in so Colorado .. so I’m going to run to the store to pick up what I need – then staying inside today and making this incredible dish! ps: Beautiful photos! I don’t watch many shows on the Food Network, but Ina’s in one that I never miss. 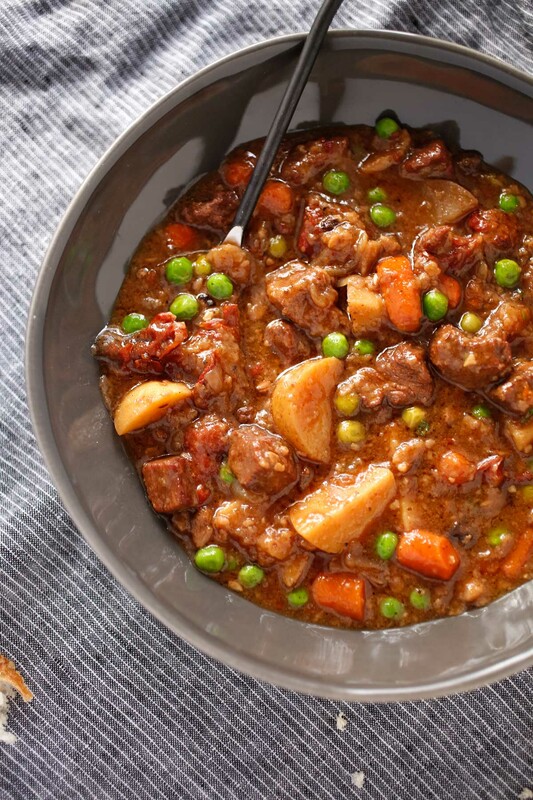 Her recipes are pure comfort food and this beef stew sounds phenomenal. I love this story. You reminded me that I need to try out Airbnb one day. I’ll have to make this stew soon. It’s starting to get chilly and this is perfect on cold nights. Oh no! I saw your blog title Veggies by Candlelight and got really excited with the pictures thinking it is a vegetarian curry but nope- it turned out to be beef curry and now I am sorely disappointed. Never mind, I loved your narration of the old man and the lady finishing up their crossword puzzle drinking red wine. I love recipes that have stories attached to them. It makes them more special and it makes the food taste that much better. This looks like a great stew. And I definitely think I will try it. i loved reading this story. what a lovely visit with your daughter. and i think cooking would be so much more fun if stories like these were attached to the recipes more often! Good old recipes! It’s amazing how food can connect and create memories. Just the other day I suddenly remembered those meat pies my mother used to make when I was a child and when I moved out home I always asked her to make one when I was coming for a visit. What a wonderful memory of someone that was so special to you. Making this would be so warm and satisfying. We love our beef stew around my house. I love beef stew, especially when paired with crunchy crusted french bread. Fall is the perfect time of year for this dish, and just think of all the fresh veggies you can sneak into this dish. My mom and I went shopping and then stopped for brunch this past weekend. Nothing like a little mother daughter time to reflect and reconnect. I relish these times and look forward to them when my daughter is older. My mother used to make Beef Stew when I was younger. I haven’t had it years. Yours looks delicious and hearty. This is perfect for these cooler months. my tongue fell out of my mouth because it wants to slurp this baby up! I have a feeling my taste buds would never ever forget it – Ina named it right! haha! I made this over the weekend when my visiting twenty-something sons begged me for “something that tastes like home, please Mom.” (One starving student and one not-quite- starving-thank-God-he-got-a-job). I’m usually not a beef fan, but this turned out so damnably delicious I was scraping sauce out of the pot. The chuck I used needed more cooking time, but became silky and totally embedded with all of the other flavors. Thanks, Ali, for a definite winner! Now this sounds like the perfect meal for this time of year. Wonderfully warming, I wonder if my other half would like it. 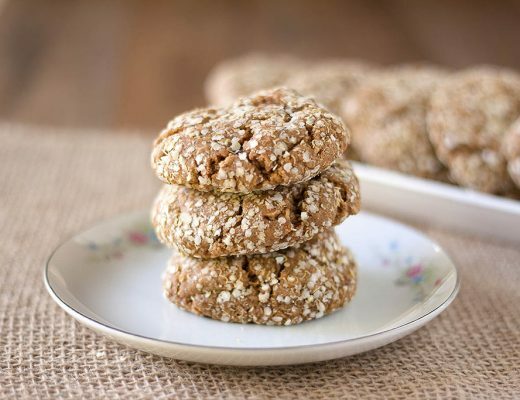 Have you tried this without the flour? Do you think it truly adds a lot? My husband is gluten-free so I’m always searching for good flourless recipes. I love all of her recipes! I have in fact made this recipe a few times and every single time I’ve made it, it comes out spectacular. I love beef stew all year round, even in the summer. I think I’ve had it twice this month already! I guess I should be proud to say that I inherited my mom’s cooking skills. I guess it was because I was the eldest that the responsibility of making dinner for the family was “forced” upon me when my parents were out working late hours. My mom and I still sit down and talk about recipes and cooking tips, although now she is old and sometimes her memory escapes her but when she is in the kitchen, everything is fine. She makes a mean beef stew too. I will try your recipe and take some over to my mom’s house. What a wonderful story. One of my saddest moments was when I discovered that my Mom’s recipe book had been lost in a move years ago. All those family recipes were gone. It’s so nice to read about you and your daughter reminiscing about foods from her childhood. Such great memories. For some very odd reason, I have never made beef stew! Which makes me want to try it even more! have to give this a go sometime! That was a wonderful story! I’ve never tried to make a beef stew! But I’m pretty sure that my family would love that! Saving this recipe! What an absolutely endearing story! What a fun read! I really felt like I was swept away there – to a Whoville-esque place – with you and your daughter. This stew I have to say does look also as if it could take me away somewhere inviting and warm! I LOVE beef Stew! It is perfect to eat on cold nights in fall and winter. This recipe looks especially yummy. The chunks of beef and veggies are so appetizing, I would grab a spoon and eat it through my screen if I could. I’m glad that gentleman inspired you to order beef stew or else you may not have shared this post with us! It’s really cool that your friend passed this along to you! Those ingredients definitely have me interested. I’m curious to see how the red wine flavors the beef and how that tastes with the stew. It sounds really good! I like your quote at the beginning of the post. My husband is a youth minister to teenagers, and that is definitely true! By the way, the recipe looks tasty and flavorful. Drooling but busy? My mom used to make a version of this recipe in the slow-cooker. She always layered it, with the beef on the bottom, veggies in the middle, spices on top overlaid with a few strips of bacon. Pour in all the liquids, go to work, come back for dinner. Thanks, Ali, for saving us from boring dinners. The beef stew does make a good meal on winter days with its hot soup and sumptuous taste. Your beef stew looks really good and no wonder, there’s a huge clamor for it within the family. This stew looks absolutely delicious! I’ve always loved Ina Garten and this recipe just goes to show why! Sounds like you had a great time visiting. That AirBnb sounds fun, small but fun. I love finding new areas to explore, especially local places to eat. This recipe looks great. My husband is a big fan of beef stew and we like trying new versions of our recipe. This one is going to be added to our meal plan for sure. There really is nothing better than a warm stew to come home to when its cold out! So awesome!! I kind of wish I could see that air bnb. Whoville sounds adorable! This stew looks delicious. Imagine it is a rainy night in 1937, and you order the beef stew at your neighborhood blue plate special restaurant. This is it – the best. I like to use sirloin tip roast cut into stew chunks, so the meat is extra tender. Also, I like to use the paper bag method for dusting meat. Put flour and seasonings and meat, chicken, etc in a paper bag, fold closed and shake. One less utensil to clean and even coating. Aww this is such a lovely nostalgic post. My granny collects recipes and I tend to keep them so I can cook these for my family and children. Your beef stew looks delicious! I love a good stew recipe and this one sounds and looks amazing!! I need to try this ASAP!! Growing up my Mom made stew. She was a great cook and I didn’t appreciate this meal until my palate matured, by then she passed and the stew recipe went with her. Ina’s recipes are very similar to my Mom’s. This popped up in my Instagram feed and I thought I’d give it a try. It was excellent, with rich, deep flavors. Rendered a bit of pancetta to brown the meat and veggies in, removed it after rendering and added it back in with the meat and vegetables. Sun-dried tomatoes were a wonderful addition! This sounds like such a hearty stew! I would love to make a big batch of this and save a bunch in the freezer for those busy winter nights. How lovely that you saved your special moments to remember later. I am one of the rare people who have a meat allergy and can not eat red meat. The reciepe looks amazing and my family will love it But what i love most about this article is the story. It brings back memeories for me as I read it. Thank you for the extra smile this morning. This looks AMAZING! I totally pinned it so I can try it later, thanks for sharing! I love Ina Garten! I watch her show and I laugh every time she says something like, oh you need the best grade vanilla but if you cannot afford it, store bought is fine haha! I bet her beef stew would taste awesome! I would love to try this fall! This looks like the perfect winter warmer recipe! I love a good stew but I’ve never tried myself, I will have to give this a go! I just love Ina. No matter what she cooks, she makes you believe you can do it too. Her directions are right to the point, she uses ingredients that are easy to find. She always makes you feel like you could come right over and have a cup of coffee, because she talks to viewers like they’re her next-door neighbors. I have scrimped on the time once before, unfortunately. The stew meat was not tender and my husband was not pleased. I do use chicken stock instead of beef. At least I got that part right. Any Ina Garten recipe is a win at my house. She has an amazing Bolognese recipe that I love. Your friend was so sweet to share this with you. I am so sorry for your loss She is right, slow and steady when cooking beef. And I never thought about it until you mentioned it, but I always grab chicken broth, eve if I am cooking beef. The best Winter warmer and comforter, stews. Love eating stews in winter and your recipe sounds so delicious. I also replace beef stock with chicken and I make my own. Agree with you on the “slow and steady”, beef requires that. I am going to try this one out as it is different to one I was taught. Thank-you so much for sharing it with us. I love spicy beef stews, especially with the cold weather at the moment. I always loved making different foods with my mom, but I am more of a baker. Long weekends is coming and am looking for new recipe to try. This is perfect! Thanks for your generosity. I made this stew a number of years ago for a potluck at work and it was delicious! I like to add more herbs (thyme, rosemary, herbs de Provence, and even a little ground all-spice). I also chop the onion and along with a few tablespoons of oil and tomato paste, microwave it with the herbs in a bowl for about a minute on high (a trick I learnd from a Cook’s Illustrated slow cooker recipe book). Then I add this mix to the pot. I would love to visit this place you call whoville. It sounds darling! That stew sounds absolutely incredible too! I have to second Madelain’s comment about the rutabaga. It adds so much flavor. Parsnips and mushrooms are also good, maybe as a partial replacement for the carrots? But truly, a little rutabaga goes a long way. I usually add one or at most two slices (about half-inch thick), chopped into smaller bite-sized pieces. So, so, good! This looks and sounds so good! I need to try this on these upcoming cold, fall days! This is literally my idea of the perfect dish. My mum taught me to make the best dish, we have “Lancashire hot pot” which is basically lamb, potatoes, carrots and onions, and a pastry crust. It’s AMAZING! At this time of year this is just the kind of thing I want to be tucking into! Can I use veal chunks instead of beef ??????? While I haven’t tried, I really think it would be great! Ali, thanks! Very tasty Beef Stew that turned out great. Very cool photos!